"Normally, when you politely tell a person she has something on her face, she discreetly wipes it away and thanks you. 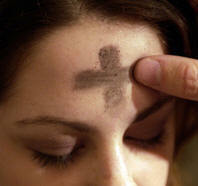 Not so much on Ash Wednesday, it turns out." -- Area resident involved in altercation. SAN NARCISO, Calif. (Bennington Vale Evening Transcript) -- Larger-than-usual gatherings of Catholics were celebrating Ash Wednesday in Bennington Vale today, marking not only the holiday but also the last Mass that departing Pope Benedict XVI will be presiding over. Unfortunately, the Ash Wednesday rituals -- largely unfamiliar to the community's predominantly Evangelical Protestant population -- led to confusion and physical confrontations. According to Mike Fallopian, Yoyodyne executive and chairman of the conservative Peter Pinguid Society, the problem began with an incident at the area Trader Joe's. "At first I wasn't sure what I was seeing," Fallopian explained. "These three women were standing in line with dirt smeared all over their faces. Normally, when you politely tell a person she has something on her face, she discreetly wipes it away and thanks you. Not so much on Ash Wednesday, it turns out." Father Preternature, who presides over the county's only Catholic church, said his membership had increased recently but that most of the people in San Narciso County have limited exposure to Catholic rituals. He did admit that it was nice to see a Catholic priest smear something on the foreheads of the community's children, and that it was just ash.